The Atacama Desert is one of the driest places in the world. Several factors contribute to its arid conditions. The magnificent Andes mountain range and the Chilean Coast Range block the clouds from the east and west, respectively. In addition, the cold offshore Humboldt Current in the Pacific Ocean, which creates a coastal inversion layer of cool air, hinders the formation of rain clouds. Moreover, a region of high pressure in the south-eastern Pacific Ocean creates circulating winds, forming an anticyclone, which also helps to keep the climate of the Atacama Desert dry. These arid conditions were a major factor for ESO in placing the Very Large Telescope (VLT) at Paranal, in the Atacama Desert. 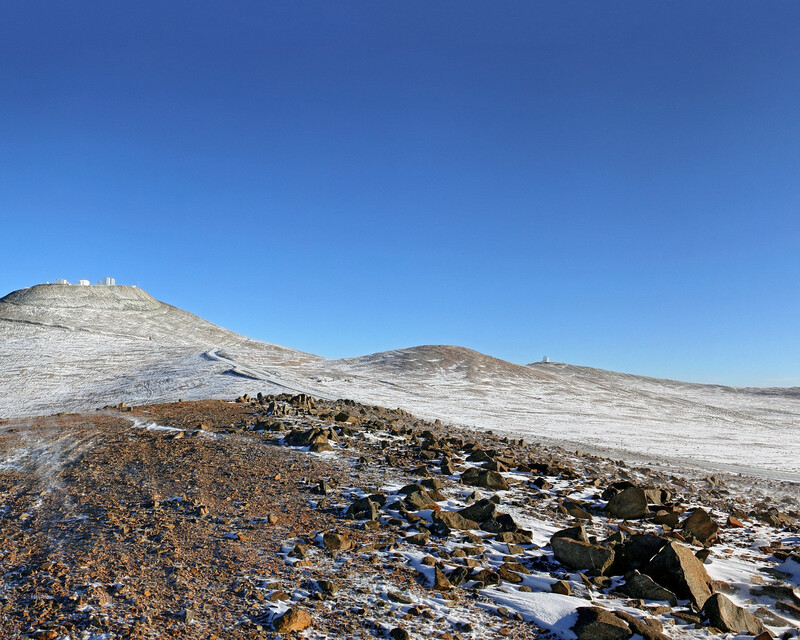 At the Paranal Observatory, located on the summit of Cerro Paranal, the precipitation levels are usually below ten millimetres per year, with the humidity often dropping below 10%. The observational conditions are excellent, with over 300 clear nights per year. The splendid conditions for astronomical observations in the Atacama Desert are only rarely disturbed by the weather. However, for perhaps a couple of days each year, snow pays a visit to the Atacama Desert. 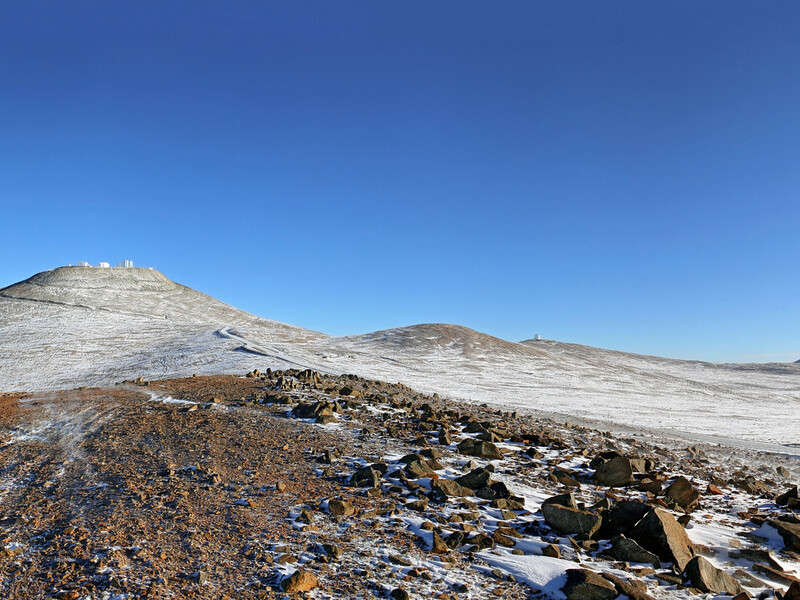 This picture shows a beautiful panoramic view of Cerro Paranal. 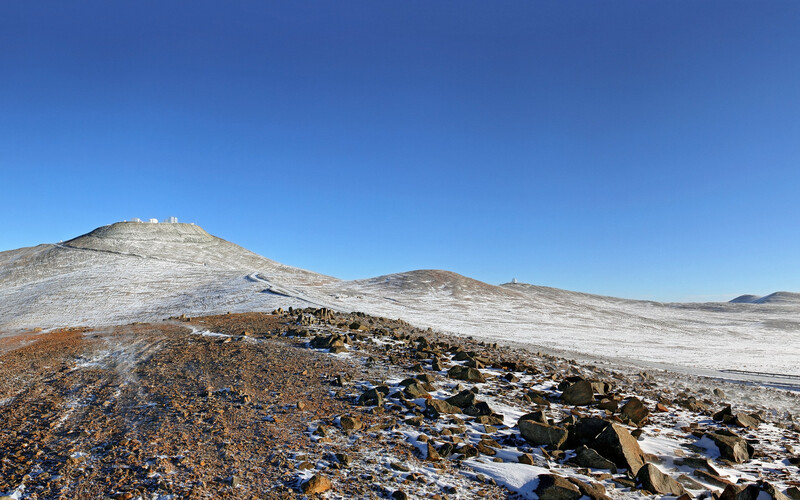 The VLT is on the peak on the left, and the VISTA survey telescope is on a slightly lower peak, a short distance to the right. The blue sky shows that this is yet another clear sunny day. This time, though, something is different: a thin dusting of snow has transformed the desert landscape, producing an unusual view of rare beauty. This image was taken by ESO Photo Ambassador Stéphane Guisard on 1 August 2011.